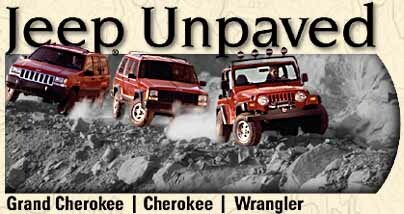 Welcome to Jeep Unpaved where you can check out all the facts, prices and available equipment on the latest Wrangler, Cherokee and Grand Cherokee models. Also experience the many journeys and places you can go with your Jeep vehicle in Journeys, off-highway adventures sponsored by Jeep for Jeep vehicle owners in Discover, and a history of the 'Mighty Jeep,' the vehicle that unpaved the way for off-highway freedom. About this Web site: This Jeep Web site provides product and promotional information about Jeep and its products. The information contained in this site is (C)Copyrighted and may not be distributed, modified, reused, reposted, or otherwise used outside the scope of normal Web browsing without the express permission of the Jeep Division of the Chrysler Corporation. This Web site also contains images Copyright © 1996 PhotoDisc, inc.